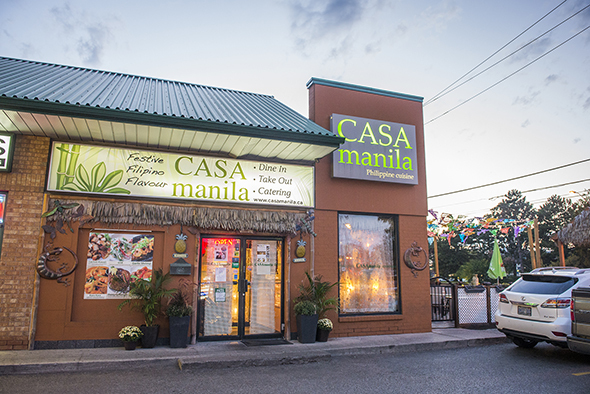 Casa Manila is a popular, long-standing institution to classic Filipino food. 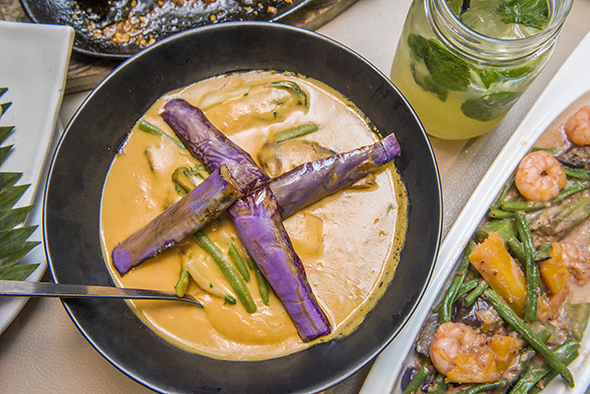 The restaurant mostly eschews the modern approach to fusion Filipino cuisine and instead focuses on authentic homestyle food. It's impossible not to be at least a little bit in awe at the inside. 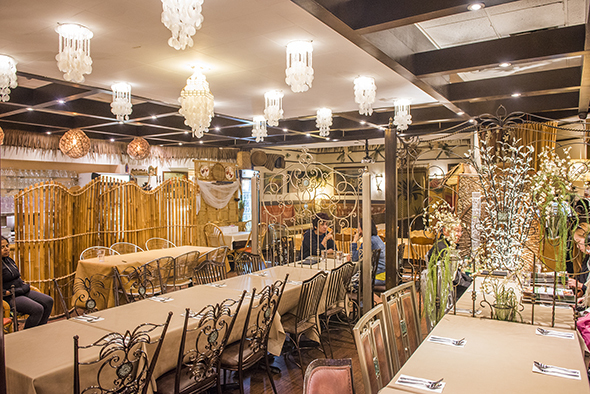 Faux pillars, iron gates, and rattan chairs are just some of the flourishes. 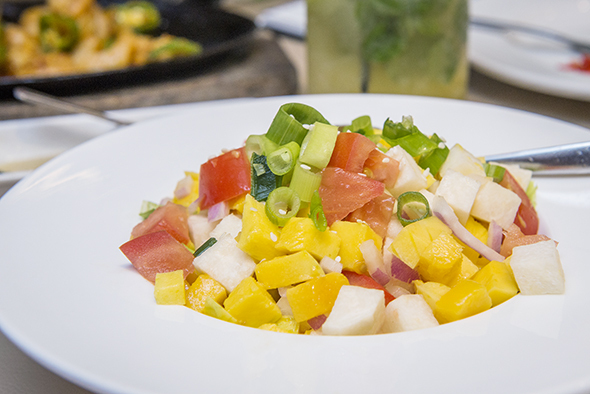 The Green Mango Salad ($12) makes for a refreshing starter. Green unripened mango (much different than the sweeter ripe mangoes you normally get in most other mango salads) is paired with jicama, a sesame dressing and a Filipino shrimp paste called bagoong. Casa Manila offers the ridiculously indulgent sisig in a variety of ways. The Crunchy Sisig Hot Plate ($15) is fried pork mask served on a sizzling plate, adorned with a raw egg (+$2) that you cook at the table. The result is an unbelievably creamy and crunchy dish that you simply have to order. 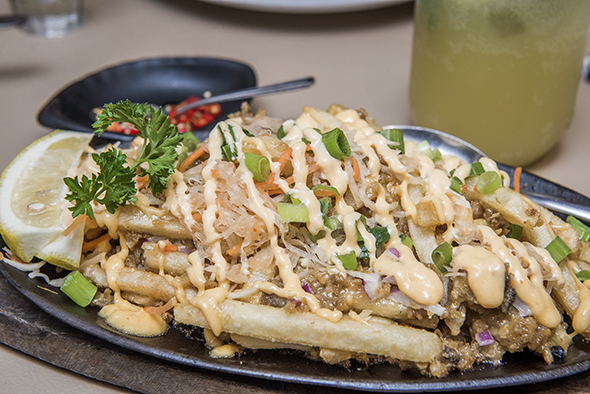 The Sizzling Chicken Sisig Fries ($12) is like a Filipino take on poutine. Garlic aioli is drizzled on top of the crunchy sisig and crispy fries. This is packed with flavour. 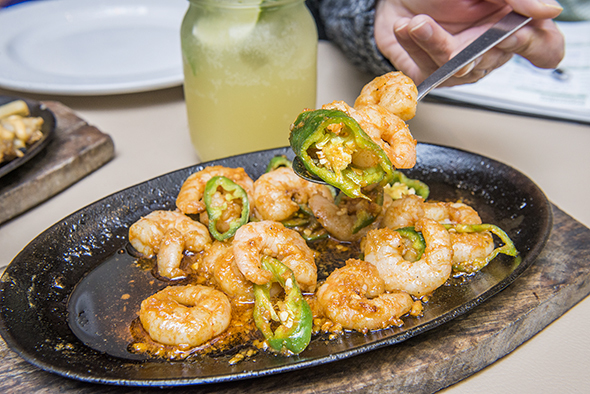 Seafood fans should order the Gambas Al Ajillo ($16). It's served on a sizzling hot plate and is satisfying, if a bit small on the portion size. The shrimp mixed with bird's eye chili are borderline divine. 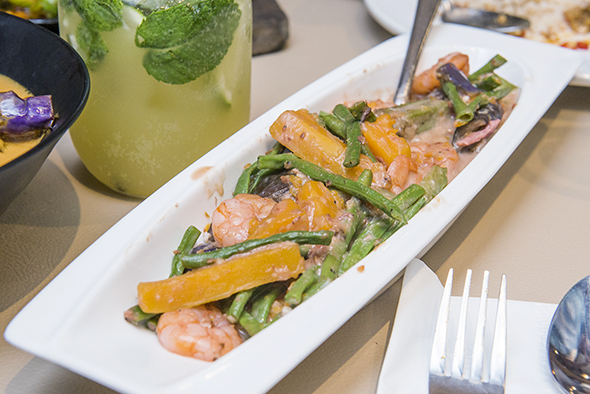 The Shrimp Bicol Express ($17) may sound like the world's most delicious train, but it's actually fresh shrimp with a selection of veggies (such as okra and long beans) mixed in a delicious coconut ginger sauce. The Kare Kare ($18) here is also excellent. The velvety-smooth peanut stew with a vibrant colour comes with tender oxtail and beef with a selection of tropical vegetables. For dessert, the Halo-Halo ($9.50) is probably the best one I've had in Toronto. 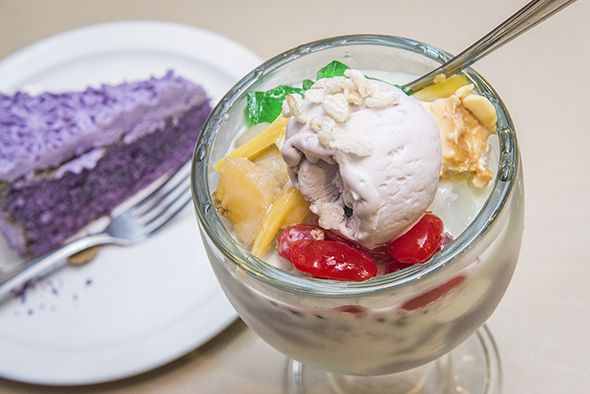 It comes with sweet beans, assorted fruit, ube, custard, condensed milk and ube taro ice cream. They also have a much larger version in a bowl. 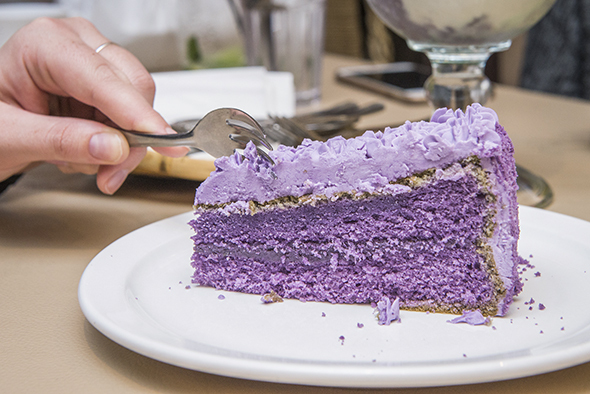 Those who prefer something slightly less substantial should try the Ube Layer Cake ($7) - a humble yet delicious classic layered cake topped with ube buttercream icing. It's rich and not too sweet. 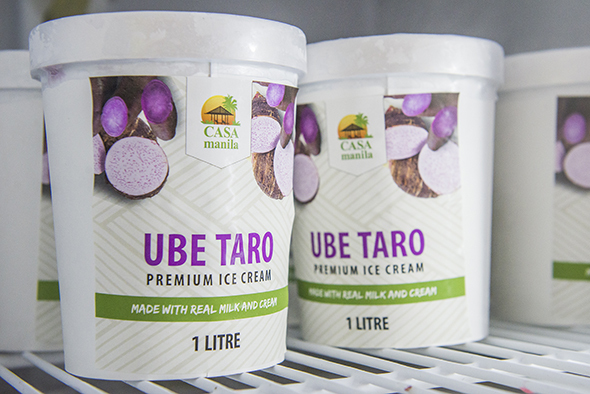 Casa Manila also sells its own line of ice cream, all in various unique flavours like Island Avocado and Ube Taro. They're made at the Marble Slab in Markham and are available in one litre tubs ($13 for one or $20 for two, taxes included). Make sure to grab one (or a few).